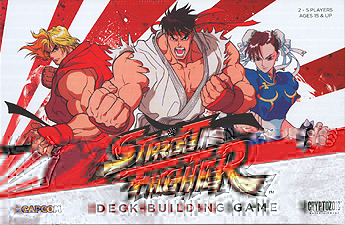 Choose your fighter and challenge your rivals with the Street Fighter Deck-Builder Game! Take on the role of Ryu, Ken, Chun-Li, Balrog, M. Bison or one of the other classic combatants as you travel to exotic locales to lay claim to the title of "World's Best." While you begin only with basic combat manoeuvres, you'll gain allies, earn equipment and master new powerful moves, with the goal of defeating as many Stage Bosses as you can. The Street Fighter Deck-Building Game brings the fight to fans the world over!